The USC Campus provides additional parking opportunities and is located one block north of the Coliseum on the north side of Exposition Blvd. Entrances are located at 36th Street and Vermont, South Figueroa Street and McCarthy Way. During USC Football parking on campus is mostly reserved in advance. Public parking may be available at the USC Parking Center (3401 Grand Avenue) on a first-come first-serve basis for $25 cash only (prices subject to change without notice), with shuttle service to the game provided 3-hours prior to kickoff, and resuming at the start of the 4th quarter until 1 hour after the game. Public parking is also available in surrounding surface lots on Figueroa Street and Vermont Avenue at the Browning Street Garage located at Browning Street and Vermont (across from EXPO Park, Lot 2). Parking may be available in other lots near LA Live and the LA Convention Center. Take Metro for transport to USC/Exposition Park. 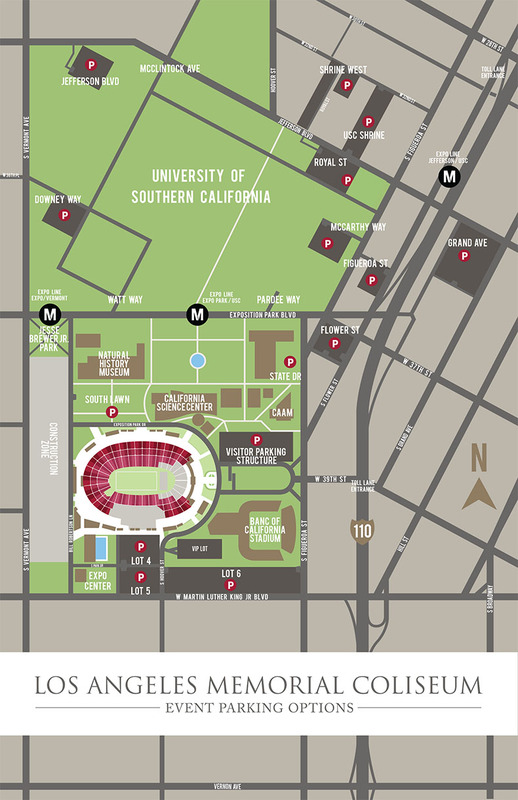 For guests driving to the Coliseum for an event, we have multiple parking options for you to choose from, including parking on the USC campus which is just a short ten minute walk to the stadium. To avoid lengthy traffic and parking delays, we highly encourage all guests to take public transportation whenever possible, including the Metro rail line which has a stop on Exposition that is less than a five minute walk to our security gates!